Christmas is the most glittery and magical time of the year and there is nothing we love more than adorning our homes in one-of-a-kind tree decorations, baubles, fairly lights and quirky decorative accessories that make us smile! This year we have a selection of witty, rock ‘n’ roll and utterly unique Christmas decorations that will help you curate your most stylish and stand-out festive interior. Eye catching and easy to use, our paper Glitter Star decorations are a gorgeous Christmas or New Years Eve party styling product. 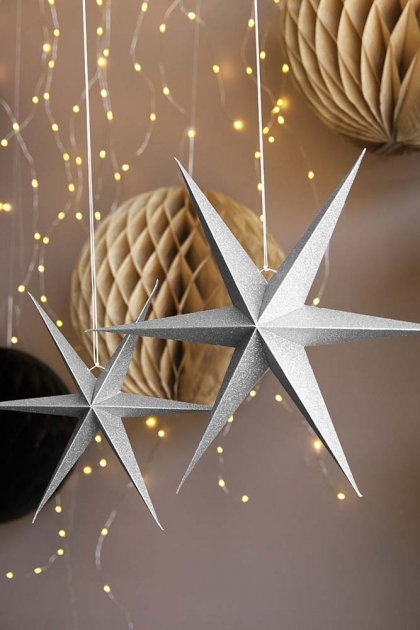 Pin to your ceilings, hang from a staircase or hang on doors to give a room that extra wow-factor – the Set Of 2 Silver Glitter Star Decorations are real eye-catchers that will add a dash of magic to your home this Christmas! Available in gold and silver why not pair the Star Decorations with our honeycomb balls and fairy lights to create maximalist magic in your home this Christmas!